The debate over school sport reached Prime Minister's Questions today, with Ed Miliband putting David Cameron on the spot over cuts to the school sport budget. The Leader of the Opposition urged Mr Cameron to "overrule" Michael Gove, warning him he "will live to regret" the £162 million abolition of School Sport Partnerships, which have a proven track record of success. The debate over school sport reached Prime Minister’s Questions today, with Ed Miliband putting David Cameron on the spot over cuts to the school sport budget. The Leader of the Opposition urged Mr Cameron to “overrule” education secretary Michael Gove, warning him he “will live to regret” the £162 million abolition of School Sport Partnerships (SSPs), which have a proven track record of success. Mr Miliband cited a letter from Jo Phillips, school sports coordinator at Chipping Norton School in the prime minister’s own constituency, who was left “devastated to witness the potential demise of this legacy with the sweep of Mr Gove’s pen”. Mr Cameron countered by trotting out the usual stats about intra- and inter-school competitive sport, yet, just like his education secretary, failed to put them in the context of previous years and the dire state of affairs pre-97, when only a quarter of pupils enjoyed two hours’ sport a week; the figure is now 95 per cent. As Left Foot Forward reported last month, the proportion of pupils involved in intra-school competitive activities rose from 58 per cent in 2006/7 to 78 per cent in 2009/10, while the proportion of pupils involved in inter-school competitive activities rose from 35 per cent in 2006/7 to 49 per cent in 2009/10. The proportion of pupils regularly participating in competitive sport (the measure quoted most frequently by Messieurs Cameron and Gove) also increased in the past year – up significantly from 28 per cent to 39 per cent for intra-school competition and up from 19 per cent to 21 per cent for inter-school competition. The prime minister also said the number of schools offering rugby, hockey and gymnastics had fallen. This is true. 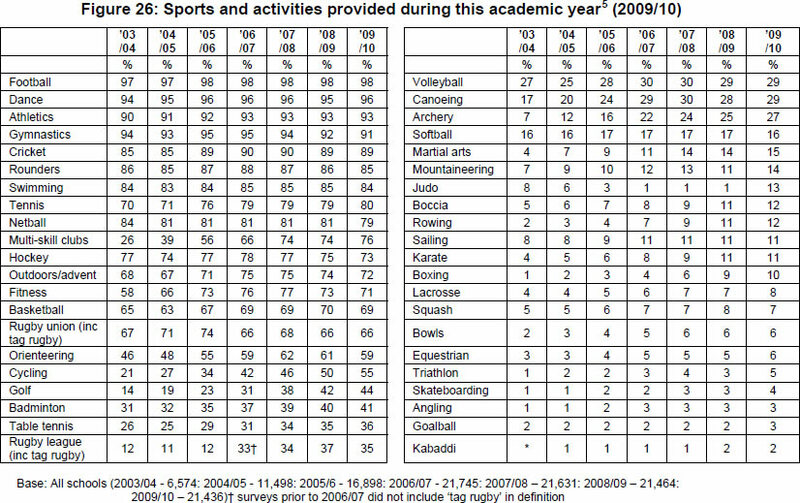 From 2003/04 to 2009/10, the proportion of schools offering rugby union fell (from 67% to 66%), while for hockey it fell from 77% to 73%, and for gymnastics from 94% to 91%. 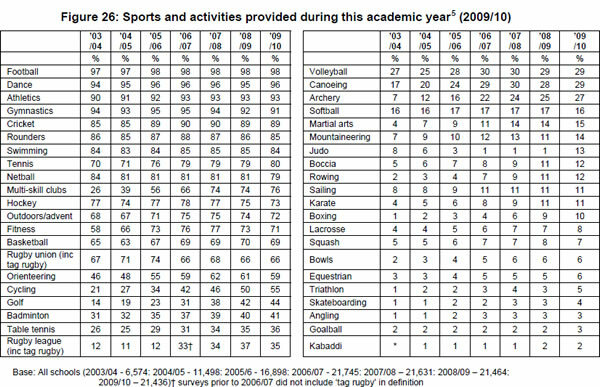 However, these three sports, along with rounders and netball, are the only ones to have suffered a reduction in the proportion of schools offering them. 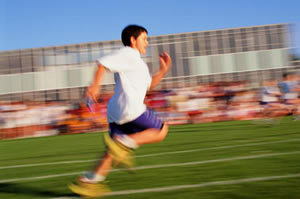 “There is obviously a risk that Gove’s approach will lead to a greater divergence of sporting experience in schools. The real beneficiaries of the decline of state school sport were the independent schools. The gap between the sporting haves and have-nots has undeniably widened. “… these are not rich private schools that can afford or have the staff to transport kids by bus to other schools twice a week. Instead in the state sector the SSPs provide sport within schools in the main, with the help of local clubs which lend them their facilities. It is not the day for Cameron to do a U-turn on this. But he is too sensible not to see that Gove has made a big mistake on this, having failed completely to consult within government and among teachers. “The reason the U-turn will, I think, come is that the school sports partnerships are patently successful at providing sport within schools, which is the really vital thing and heads know that. I have yet to come across a headteacher who agrees with what Gove is doing. The simple fact is that the government has no plan for an olimpic legacy. It was pretty obvious listening to PMQs that even Cameron knew this move was indefensible. Of course he still tried by cherrypicking data that seemed to suggest failure where there isn’t any and by emphasising inter-school/city sporting events (but without context of course) when that is only a small part of what the policy has done. Oh and his usual personal insults when he knows he’s in weak ground but wants to look strong. world of sport for many poorer children. Recognition of their achievement is much more important than the ill informed criticism of Gove and Cameron.